Child hides eggs in wardrobe. 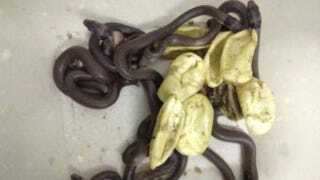 Eggs hatch deadly, venomous snakes. Because Australia. When three-year-old Kyle Cummings found a stash of eggs near his home in Townsville, Queensland, he did what any three-year-old would do: he gathered them up in a plastic container, took them home, squirreled them away inside a wardrobe and then tottered off. Later, his mother discovered the eggs had hatched seven eastern brown snakes — only the second most venomous snakes on Earth. Fortunately, nobody was bitten, and the snakes have since been released in the wild. The reptiles were only 12-15cm long, according to Trish Prendergast of North Queensland Wildlife Care, who released the snakes. "Their fangs are only a few millimetres long at that age, so they probably couldn't break the skin, but they're just as venomous as full-grown snakes," she told the Associated Press news agency.